Perfectly balanced for the hockey player sweeping up roles right across the pitch, the adidas LX24 Carbon hockey stick featuring my favorite adibow24 shaft shape is an awesome stick. If you have never experienced the adibow24, let me tell you how it feels. At 250mm up from the heel of the stick the 24mm curve sits at a point between extreme and too high that gives you the control and 3D techniques of the low bow with the straight bat hitting feeling of a piece of wood. If you used your hands instead of a stick in hockey the adidas LX24 would be like giving the ball a cuddle, gently embracing it and leading her round the pitch on a waltz. Then, when you see the opportunity, the adidas LX24 Carbon has a supreme amount of power to slap her (the ball) down the field nice a smooth to meet the cross field run of your forward. 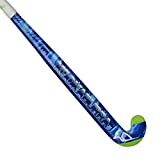 We jest a little, the point is this, the adidas LX24 Carbon is for the player who gets involved, is always ready to receive the ball, makes quick choices on what to do with it next and needs complete faith in their hockey stick to keep up. Top of the range and a full 90% carbon hockey stick the adidas LX24 Carbon model has increase power output with the adidas DUAL carbon rod system. This system runs super stiff carbon rods through the middle of the shaft minimizing flex when hitting the ball. While the carbon range from adidas is built for power, a combination of the aramid content in the head and the foam filling to the shaft makes the adidas LX24 Carbon a perfect balance of power and feel. One of the best I have tested at taking the shock and resulting bounce out of incoming passes. Assisting with the theme of control in the adidas LX24 is the touch compound on the face of the stick which seriously increases ball control for quick, close turning of the ball when dribbling. I get so excited about most hockey sticks I play with and the adidas LX24 Carbon sends my excitement in to overdrive when completing this review. One of the most perfect all round sticks on the market, it might be expensive but worth the money. You can find a full overview of the best adidas hockey sticks review page on this site.